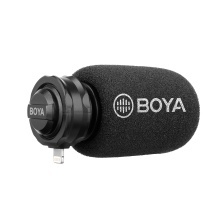 The BOYA BY-DM200 is a professional stereo condenser microphone which can plug directly into for Apple iOS device with a Lightning connector. With two built-in microphone capsules to create good stereo sound effect. Compared with iOS devices built-in mic, BOYA BY-DM200 can greatly improve the sound performance while recording music, video and speech etc. Cardioid polar pattern digital stereo X/Y condenser microphone. Compatible for iOS devices, such as for iPad, for iPhone, for iPod touch. Plug and play. 24-bit/96kHz converter. Foam windscreen, fur windshield and carrying pouch are included. You can check and verify the product, just input its model on Apple official website.